Composting of waste plant materials and its use in agriculture and landscape sites is an environmental friendly way of reducing waste material and conserving the environment. In this perspectives we have taken the initiative at the Dubai based International Center for Biosaline Agriculture to compost the plants based waste material (lawn cuttings-grass) to compost. The material was inoculated with a consortium of microbes leading to form stable and mature compost with high organic matter (38%). In order to conduct seed germination tests, Fulvic acid was extracted from the compost. 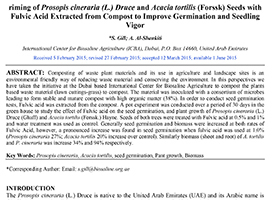 A pot experiment was conducted over a period of 30 days in the green house to study the effect of Fulvic acid on the seed germination, and plant growth of Prosopis cineraria (L.) Druce (Ghaff) and Acacia tortilis (Forssk.) Hayne. Seeds of both trees were treated with Fulvic acid at 0.5% and 1% and water treatment was used as control. Generally seed germination and biomass were increased at both rates of Fulvic Acid, however, a pronounced increase was found in seed germination when fulvic acid was used at 1.0% (Prosopis cineraria 27%; Acacia tortilis 20% increase over control). Similarly biomass (shoot and root) of A. tortilis and P. cineraria was increase 34% and 94% respectively.